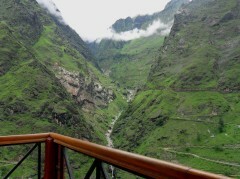 On your last night on the Valley of Flowers trek, you'll be staying at a lodge in Auli. This is a brand new lodge is perched on a cliff overlooking Nanda Devi Peak, Dronagiri, Kamet, and Mana Peak. You'll be staying in twin-sharing rooms with attached washrooms with geysers, heater, a private sit-out to admire the views, and free Wi-Fi. • Stop over for one night in Auli, for views of iconic peaks like Nanda Devi, Droniagiri, Kamet, and more. Check in to a lodge in Joshimath for the night. Eat a delicious breakfast and jump aboard vehicles that will drive you to Govindghat. 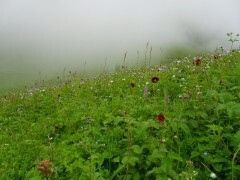 This is the start point of your Valley of Flowers trek. From here, you'll be walking through apricot trees and into the greenery. The trek is about 14 kms to get to Ghangaria, but it's not too hard and will warm you up for the rest of your trekking days. You'll check into a hotel in Ghangaria. Overnight in hotel. Today you set off into the Valley of Flowers. It's a short trek today (only 4 hours one way) and will give you plenty of time to explore the valley and admire the views. You'll cross a small sparkling stream and cross over into a wonderland of gorgeous flowers. Around you, waterfalls gush out over the tops of mountains, and you can see the mist rolling in. You'll spend the day here, and return to your hotel in Ghangaria later. Overnight in hotel. Today you begin with a trek back to Govindghat. 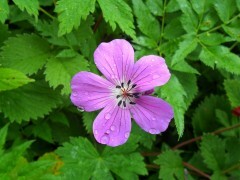 You won't feel like saying goodbye to the Valley of Flowers, with all it's natural beauty and flower-scented air. Vehicles are waiting for you at Govindghat, and will drive you to Badrinath. Visit the temple at Badrinath and travel to Auli. 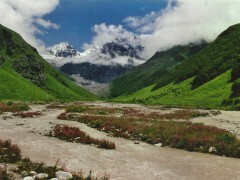 A visit to Badrinath is subject to good weather. A final call will be taken by the trek leader on the day of the visit. If the visit to Badrinath is skipped, you'll be driven directly to Auli. Overnight in hotel. 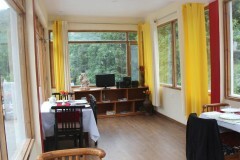 Stay in a comfortable mountain lodge in Auli. After breakfast, you'll check out and board vehicles that take you back to Haridwar. 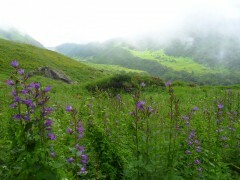 Your Valley of Flowers trek has been a spectacular experience, but you'll be happy to rest your legs after days of trekking. You'll get to Haridwar by about 18:00 hrs, and will be dropped off at the station. Trip ends here. Overnight at Ghangaria in luxury Swiss tents. You'll spend the night in luxury Swiss tents at a campsite in Ghangaria on a twin-sharing basis. The tents will be equipped with attached washrooms. Today's meal package includes breakfast, lunch, evening snacks, and dinner. All meals will be vegetarian. When available, eggs will be served as well. Overnight at Auli in mountain lodge. 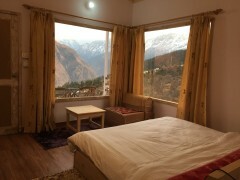 You'll spend the night at Mountain Rover or similar mountain lodge in Auli. You'll be staying in deluxe rooms with attached washrooms on a twin-sharing basis. Each room has king-sized beds, geyser, a heater, and a private sit-out. Today's meal package includes breakfast, lunch, evening snacks, and dinner. All meals will be vegetarian. When available, eggs will be served as well. Today's meal package includes only breakfast. You may visit any of the restaurants en route to Haridwar to have additional meals at an extra cost. Your trip ends here.